Have a coupon or discount code that you'd like to use with your ActionSprout account? Great! Let's walk you through how to apply it. 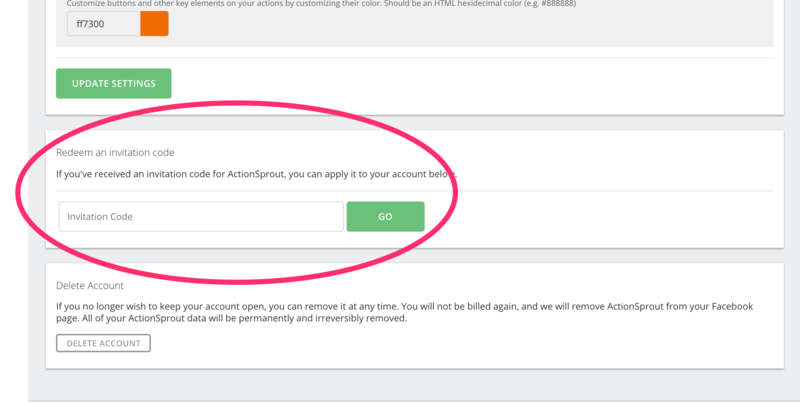 First, log into ActionSprout, go the Account screen, and select the Facebook Page that you'd like to apply your coupon to. Next, select Account Settings and then General Settings from the left-hand menu. On the General Settings page, scroll to almost the bottom of the page. Paste in your code and click go. You should see confirmation that your coupon was successfully applied.